A vocation, be it to the religious life, marriage, or the single life, is a beautiful gift from God. It is a gift from the One who knows and loves us best, and who desires our happiness more than we do ourselves. A person's vocation is the role in life to which God is calling them, and that no one else can fill. God does not force one's vocation upon them, but because He knows and loves us so well, He calls each to the place where they will naturally find the greatest peace, fulfillment and joy if they are faithful. 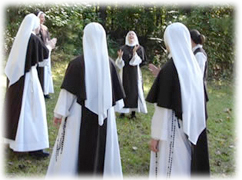 God calls each person in a unique way, but when a young woman begins to consider religious life, she is usually drawn to spend more time in prayer and to spend time with various religious orders to learn about the sisters and their apostolate, their work for the Church. After much prayer and discernment, she eventually takes the step to immerse herself in the life of a religious community, to see if it is the answer to the calling she hears in her heart. 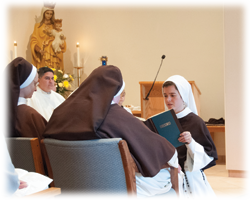 On her entrance day, a new sister is warmly welcomed into the life of the community. She will be called a postulant, which comes from the Latin word 'postulare,' meaning 'to ask', because she is asking whether she is called to live within this community. She will be addressed as 'Sister' but retain her baptismal name. The year spent as a postulant is a time of adjustment and discernment for the new sister as she becomes familiar with the daily life of the community and learns more about religious life and the apostolate. 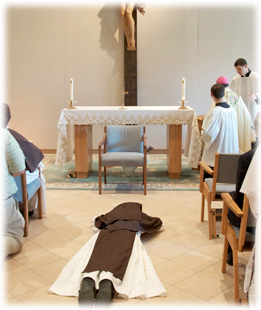 During this year of transition, postulants wear a white blouse, brown vest, and brown skirt. 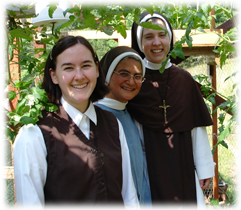 If, after the one-year postulancy both the postulant and her superiors believe she is called to the life of the community, she may be accepted as a novice. She receives the religious habit of her order as a sign of the consecration she aspires to make and as a witness to poverty. Receiving a new name is a tradition recalling the times when God gave a new name to those He called to a special role, as He did with Abraham and Peter. The two years spent as a novice are set aside for deeper studies and continued deepening of her spiritual life. She especially studies the rule and constitutions of the order and the meaning of the vows themselves in preparation to make her first profession. Again discerned by both the sister and her superiors, a sister may make her first profession of vows after her second year as a novice. She professes to live the vows of chastity, poverty, and obedience according to the rule and constitutions of the order for one year, and she renews these vows for four consecutive years. By the vow of chastity, a sister offers her life and her entire capacity to love God, to grow in deep intimacy with Him and learn to love all people through Him. She forms a spousal union with Christ, becomes the spiritual mother of all the children of God, and gives her life to helping them grow spiritually. By the vow of poverty, the sister expresses her desire to live simply and by faith, depending on the providence of God to provide for the needs of her community. By obedience, the sister promises to live in accordance with the rule and constitutions of the order, and to obey her superiors as the appointed representatives of God. Contrary to common belief, the vows of religious life are not restricting or oppressive. Rather, they free the sister to live more simply, with a clearer focus on her spiritual life and her role in the community and in the Church. If one is called to the religious life, it brings great joy that far surpasses the short-lived pleasures of the world. After five years of temporary profession, and eight years in the community, the sister may make her final profession of vows. She affirms the desire she expressed at each previous stage of her religious life, that is, to give herself to Christ in this community. Before, it was for a limited time. Now she jubilantly consecrates her entire life. Even after many years in the community, the sister will always continue to deepen her spiritual life and her knowledge of the Faith, for God is infinite and inexhaustible. Hers is a life of prayer and service, a total gift of self to God, the Church, her community and apostolate - and God will never be outdone in generosity. With the aid of our superiors, formation is truly guided by the Holy Spirit. When we cooperate with God's grace, we realize that God equips us with all that is necessary to do His will, for our Savior and Holy Spouse assures us, "It is not you who chose me, but I who chose you." Therefore, we are able to do as the Lord commands, "Duc in altum," or Put out into the deep, remembering that Jesus promises "one hundred-fold" in return for our total gift of self. Blessed be God in all His gifts.